Visits to Wyandotte, MI, to spend time with Mom are bittersweet. It is a joy to see her laugh or to recall some glimmer of days gone by. Sometimes, she puts her face very close to mine, just so she can touch it to reaffirm that one of her babies really is there. But I am no longer a baby at 53, and Mom is 84 and a stroke survivor of 13 years. Age and that disability have taken their toll. She is often quiet and confused, and her memories are uncertain. She is slipping away from me gradually. Like she grasps at my face, I grasp at the memories. Restaurant meals on these trips are less about adhering to a low-fat diet. Instead, they’re chosen as a link to the past. Sibley Gardens in Trenton, MI, was one of those choices. In my youth, it was a restaurant for special occasions, such as dinner out with my confirmation sponsor. 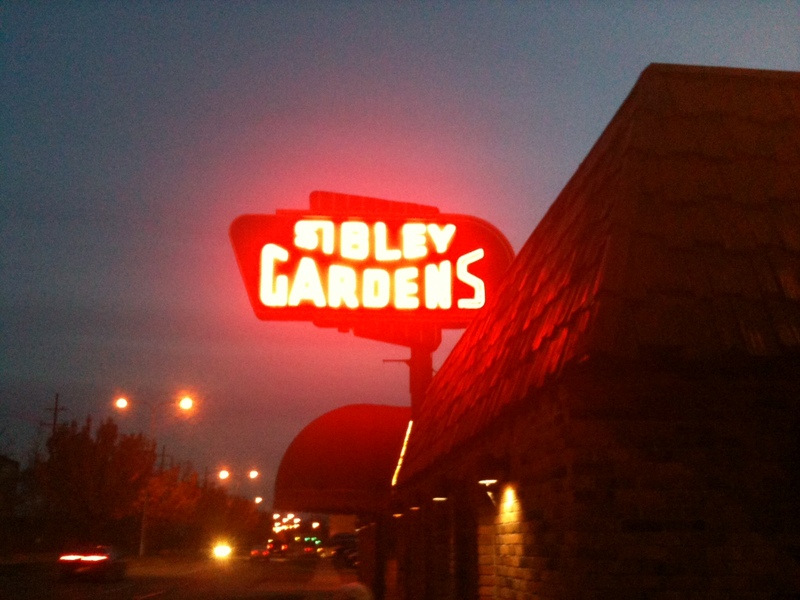 On a recent fall evening, with the sun already set, the glowing neon sign seemed a chimera. It stood out, almost ghostly in the darkness of the surrounding area. Across the street was the hulking ruins of McClouth Steel, a long closed victim of Detroit’s decline. In its heyday, at this hour the second shift would have been setting in for a long night ahead, earning the factory paycheck that would allow them the occasional dinner at the restaurant across the street. Instead, there was a sad quiet. Although a reputation for fine dining at reasonable prices has sustained the restaurant since 1935, it is perhaps telling that the website for “Downriver’s Favorite Italian Steakhouse” touts its availability for funeral luncheons. A way of life certainly has died. Decades of global competition and economic and political policies have all but wiped out the working class. At dinner, we grasped lustily at what remained of that time. Mom enjoyed Chicken Marsala for $16.95, which included soup or salad and a choice of potato, pasta or vegetable. All the finer restaurants of my youth arranged their menus so — a la carte was something one learned about after college. The menu is heavy on tradition. Chicken and veal can be had picante, marsala or parmesan. There’s surf and turf, frog legs and a fried seafood platter. A pasta section includes a bolognese, an Alfredo, and, of course, meatballs or Italian sausage. 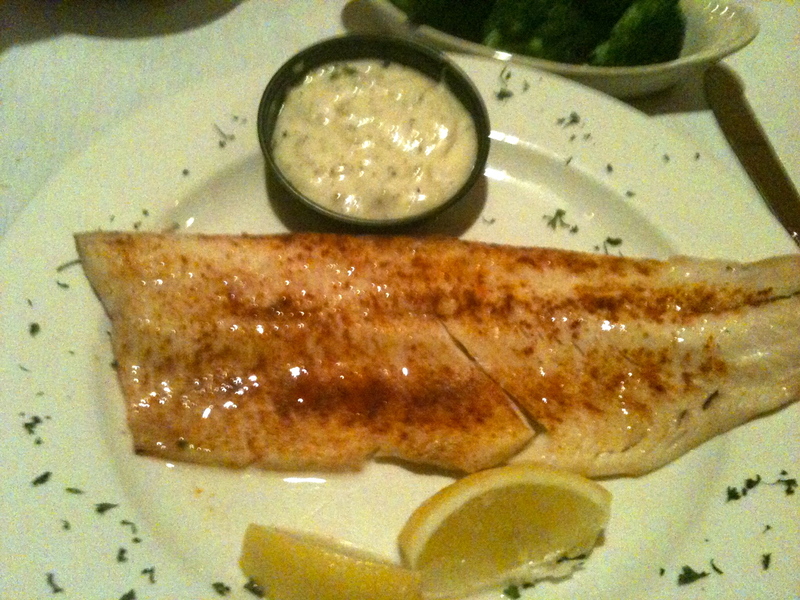 Fortunately, in a seafood menu updated to reflect today’s tastes — scallops in a citrus beurre blanc or coconut shrimp — there was one standby that was perfect for The Restaurant Dieter: a broiled Lake Superior Whitefish. It arrived as requested, broiled with very little fat. But it tasted of fish — fresh fish — not something papered over with today’s food trends. With a salad and broccoli, it provided the perfect meal for Mother’s little boy who isn’t so little anymore. More important, though, it provided a connection to a past that seems to slip away every day. Review: Moro’s of Allen Park, Mich.
Another visit home to care for Mom, another opportunity to stuff my face until it hurts. Although visits home are typically when the worst comes out, the most recent trip to suburban Detroit yielded a surprise worth mentioning. Mom and I went to Moro’s. The restaurant has a long history in the suburbs south of Detroit. My generation took dates there before a big school dance like the prom. It’s tiny, dark and cozy, with white linen tablecloths and waiters in tuxedos, even on a Tuesday night. The waiters mix the salad at your table. The menu is not, in itself, diet friendly. It’s heavy on classic red-sauce Italian dishes like veal parmesan, chicken cacciatore and fettuccine Alfredo, even though there are a few dishes like broiled cod. I was in full, face-stuff mode and went for the cannelloni. I hadn’t had it in years. It was meaty, both inside the pasta shells and from the thick bolognese. Mom had veal picante. The Greek salad we ordered was drenched in olive oil by an artistic swing of the server’s arm, but I didn’t have the heart to stop his show. 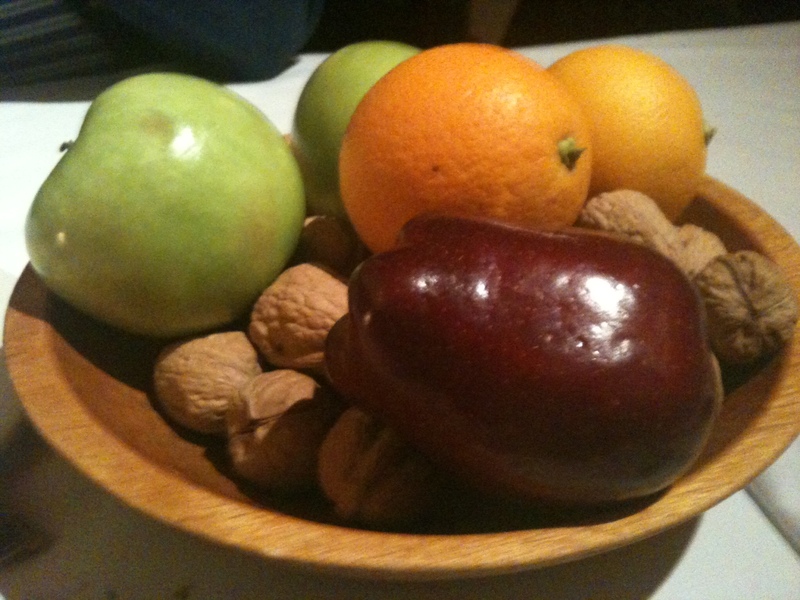 But what surprised and delighted us: at the end of the meal, a bowl of fresh fruit and nuts arrives, courtesy of the house. Perhaps it costs them a few dessert orders. More likely, it inspires gratitude from folks like The Restaurant Dieter and the dessert eaters still pass it by for the cherries jubilee. After a week at home eating whole grains, fruits and vegetables and lean proteins, my mom and I recently sat down to a Maurice Salad and memories of growing up in better times for Detroit. This is a main dish salad that in no way can be called light. Be forewarned: This will not be a column about how to eat healthy at restaurants. A family visit simply isn’t a good time to diet. You dump your suitcase at the door and pick up the baggage that you’ve been carrying since birth. In The Restaurant Dieter’s case, that means the plus-sized poundage and the eating habits that lead to it. I’ve attempted to fight this in the past, mostly unsuccessfully. Then guilt sets in and propels me to the cookie jar for another biscotti. In the last couple of years, I’ve had more luck making peace with the knowledge that I’ll stumble and that I’ll return to the virtuous path when the visit is over. My visit to Detroit is a monthly effort to give my sister, who cares for my mom, a break. Mom has made a good recovery from her stroke 13 years ago. But the stroke’s effects combined with general aging require the presence of another adult. She is no longer the fireball who kept all the trains running on time, and that alone can be enough reason for emotional eating. But going out to dinner or lunch is something we can do together and gets Mom out of the house. 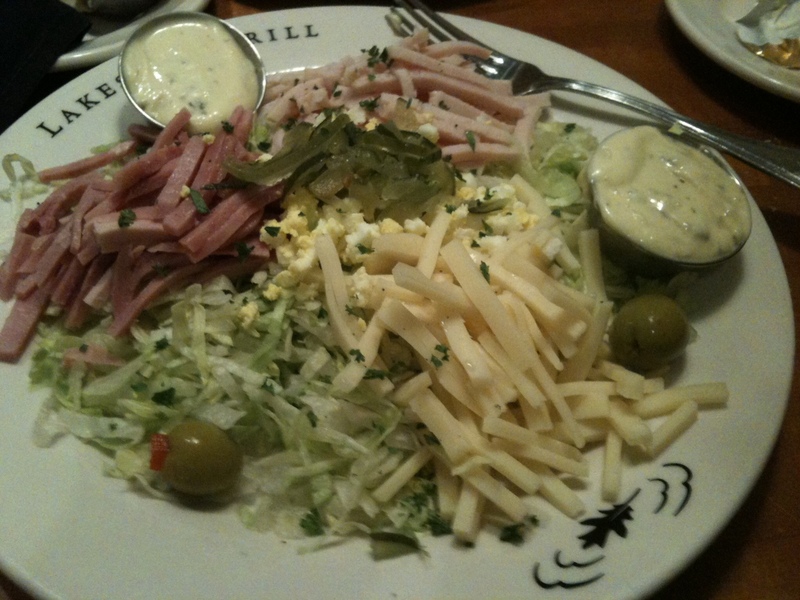 So we found ourselves at Macy’s at the Southfield Mall in Taylor, Mich. We went in search of this famed Hudson’s Maurice Salad. To this day, I’ve never been to another restaurant that serves this salad. A recipe for the dressing is pretty common on the Internet, though it’s unclear if it was ever officially sanctioned by the store. I’ve had reasonable success provided I substitute two mashed egg yorks for the hard-cooked egg that’s called for. By now, the native Detroiters have been waiting for me to mention that this salad is not a Macy’s phenomenon at all. It has its roots in the heyday of Detroit’s most prominent retailer, J.L. Hudson, which was acquired first by the Marshall Field chain and later Macy’s. In Detroit’s heyday, J.L. Hudson’s downtown Detroit was the store by which all others were judged, where the ladies lunched and where the Maurice Salad was born. Before suburbanites gave up on Detroit, Mom took me on the bus downtown to shop and get herself a Maurice Salad. The whole store was magical, especially at Christmas. Detroit unsuccessfully fought off, then mourned, the demise of this landmark. Presented on a platter, Maurice Salad is a fairly common composition of julienned head lettuce, ham, turkey, swiss cheese and pickle. What distinguished the Maurice from an ordinary chef salad was the rich, yellow-green, eggy and lemony dressing. The damage from a single serving of Maurice Salad is listed at one website at 479 calories with 27 grams of fat, but that still seems undercounted given the size of the portion and the fact that I nearly licked the plate clean. The two portion cups of dressing alone would yield 200 calories and 20 grams of fat if counted as a standard mayonnaise. And then, because Mom has developed quite a sweet tooth, we had to go for Stroh’s Ice Cream, another institution from Detroit’s heyday. The ice cream line was added by the Stroh Brewery Co. in the 1920s when Prohibition rendered its beer business illegal. It wound up being profitable enough that the company kept it after Prohibition ended. 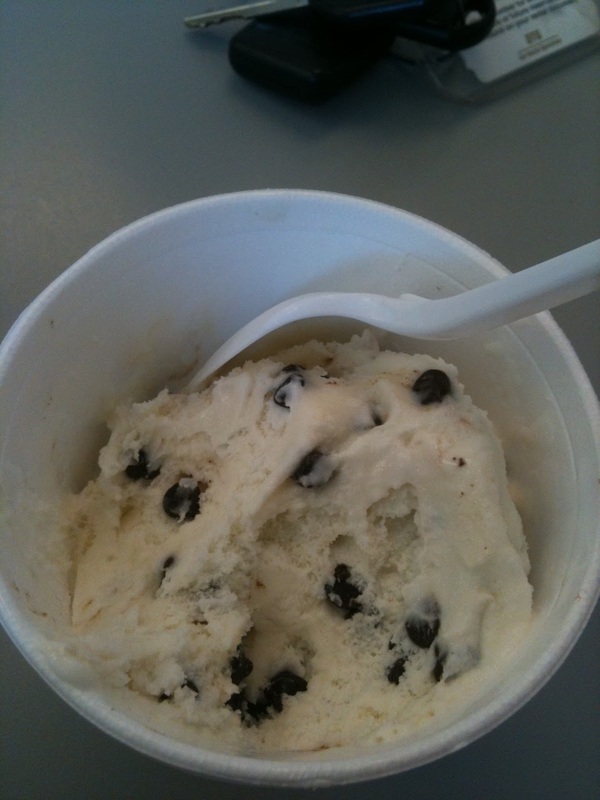 Nowhere will you find a chocolate chip with so many chocolate chips. And these are not the odd-sized little drips and shavings that are typical in ice creams. These are real, plump bittersweet chips. One is ensured a chocolate crunch with each creamy bite. This past weekend wasn’t a diet adventure at all. But it was a lovely walk down memory lane with Mom. The whole grains will always be there.